Yoder Smokers Community Forum • View topic - Igniter replacement, replace thermocouple also? Igniter replacement, replace thermocouple also? Hello all, after many great cooks on my ys640 I am having problems with tripping the GFCI. I am going to do a manual lighting test tomorrow to verify that the igniter is my problem. Question I have is should I replace the thermocouple at the same time as the igniter? Saw an online post that recommended replacing both if replacing one. Re: Igniter replacement, replace thermocouple also? Personally, I wouldn't. The two are independent of each other and really do not take long to replace. In my mind its kinda like replacing both headlights on your car when one goes out...even though one has reached the end of its lifespan does not necessarily mean the other is gunna go anytime soon. I would however order a thermocoupler if you do not have one on hand as there is nothing worse than blowing one and being without when it is only a 20 minute fix. We at the Yoder Smokers factory have never stated that both the igniter and thermocouple should be replaced at the same time. They are completely separate systems and have nothing to do with each other. 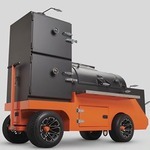 There are a lot of self proclaimed "experts", but if you need Yoder Smokers factory help, contact us at 877.409.6337, option 2, or send us email at customerservice@yodersmokers.com. If either the thermocouple, or the igniter, have failed, just replace the part that has failed. Keeping a spare thermocouple is a popular thing to do, so if you have a cook and find that the thermocouple is bad, you can immediately replace it, as the cooker will not function without a working thermocouple. Some people also keep a spare igniter, but this is not necessary, as you can always follow the instructions in the owners manual on hot to manually light the cooker. Thanks guys!! I got it to light normally today and did a burn out of the grease, etc that had built up from winter cooks. It burned along great at 500 for about 45 minutes and then tripped the GGCI. I unplugged and tried to relight twice but tripped the outlet again after only a few seconds. At least I got the burn out done. Ordering a couple of igniters and a thermocouple spare today. Still the best cooker in my opinion. Thanks again for the insight.